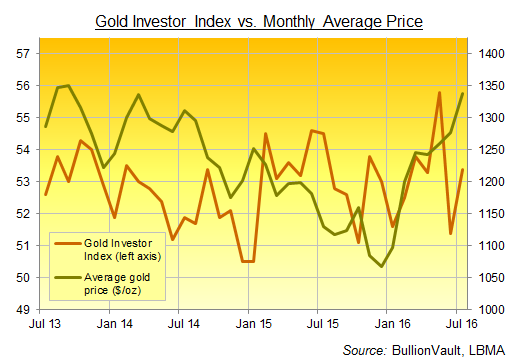 GOLD and SILVER BUYING was more popular amongst private investors in July than any month since the precious-metals crash of April 2013 unleashed a flood of demand, writes Adrian Ash at BullionVault. July's growth came even as the price of both gold and silver rose sharply to hit 2- and 3-year highs against most major currencies after the UK's Brexit referendum result of late June. BullionVault, the world's leading precious metals exchange online, saw 1.5% more investors buying gold last month while the number of silver buyers rose 38%. Selling retreated from June's new records, with the number of investors choosing to take profits or cut losses down 23% in gold and 6% in silver despite July's rising prices. That saw BullionVault's Gold Investor Index – which measures the balance of private investors buying gold to start or grow their holding across the month over those reducing or selling them entirely – rise from 51.4 in June to 53.4 last month. These figures complement other gold and silver market data, showing revealed preference – not survey-based 'intentions' – amongst the world's largest single pool of self-directed bullion investors. A reading of 50.0 on the Gold Investor Index would mean the number of people buying gold net-net across the month was perfectly balanced by the number of sellers. The Gold Investor Index hit a 3-year high at 55.8 this May, and peaked at 71.7 when gold prices hit their current all-time record highs in September 2011. 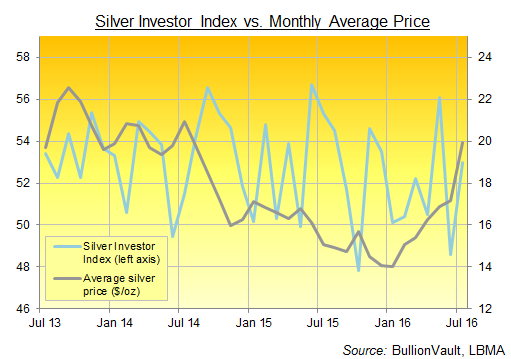 BullionVault's Silver Investor Index meantime recovered to 53.0 in July after dropping to 48.6 in June. This year's return of private investors to buying gold and silver is proving as solid to date as 2016's uptrend in prices. Although lower than June's 3-year record, the number of new BullionVault users funding their account for the first time stood 63% higher than the previous 12-month average in July, with the number of new UK users standing 97% higher. New Eurozone users rose 20% from the last 12 months' average, led by growth in Germany, the Netherlands and Belgium. The number of new US users was the largest since February 2012, some 66% ahead of the previous 12 months. After the Brexit shock in June, the continued surge in demand to buy bullion suggests that November's race for the White House is becoming a clear concern. That continues to give existing owners an opportunity to take profit or cut losses – a switch from the gold and silver bull market a decade ago, when Western investors hadn't yet built precious metals holdings they could sell down. But the more desperate that central bankers become to juice growth and inflation, meantime, the more they succeed in minting new gold and silver buyers amongst household savers. July's retreat in investor selling meant trading turnover eased back, dropping from June's 5-year record of £119 million ($170m) on BullionVault to £88m ($116m). It still totalled almost twice the 2015 monthly average of £45m ($69m). By weight, BullionVault users were light sellers of gold in July overall, with clients' audited holdings dropping 0.04% from June's new end-month record high to stand 13 kilograms lower at 35.2 tonnes, more than most of the world's central banks hold. Silver holdings grew a further 0.3%, adding 2 tonnes to reach a new record 603 tonnes. Over the last 6 months, private investors have added 56 tonnes of silver to their holdings, the most since winter 2011-2012, at prices rising 42% in US Dollar terms.